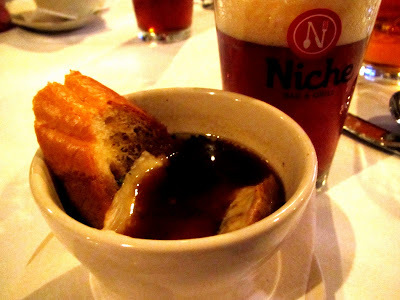 Wednesday night I had the pleasure of attending a Louisiana Beer Dinner at Niche Bar and Grill. It wasn't too long ago that this would have meant an "Abita Beer Dinner," so the fact that this can now be done without a single Abita beer on hand is exciting in itself. 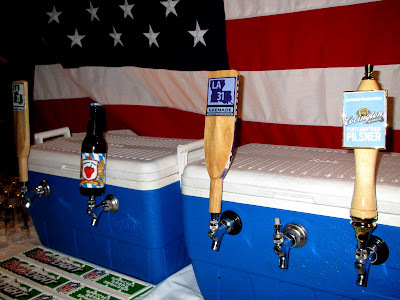 On tap were brews from Baton Rouge's own Tin Roof Brewing Company, Covington's Heiner Brau, and the Bayou Teche Brewing Company in Arnaudville. 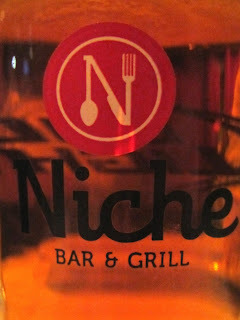 I was happy to find out about the beer dinner and get to make a larger reservation with Ause, the owner of Niche. It was a pleasure to be joined by Eric Ducote, Dustin Davis, and Jessica Jameson. Robert Romero was in town from New Zealand and he decided to join us along with his brother Jesse and a couple of other friends. Aaron LaRose also came with his lady friend and a couple more pals. William McGehee and Charles Caldwell from Tin Roof were there to drink their own beer, as was Dorsey Knott from Bayou Teche. Even a few guys from Mockler Beverage showed up to praise the craft beer that they now get to distribute! The Louisiana Beer Dinner featured a five course meal each paired with a different beer. It's hard to argue with that! And at $35, Niche also presented a great value that is sure to attract more and more people when they do it again. So, without further ado, let's get to it. Course one paired a French onion soup with the Tin Roof Perfect Tin Amber. While the soup didn't blow anybody away, it was a nice course to start off with and did pair fairly well with the beer. The soup was a little stronger than the amber brew, but at the same time I could still taste the malt and hops in the beer, so in the whole scheme of things, I'd say it worked. The second course was probably my least favorite of the evening, as it was also the least inventive. 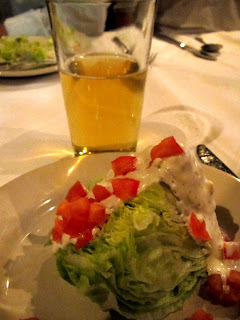 It had a bleu cheese wedge salad with roma tomatoes paired with the Pontchartrain Pilsner from the Covington Brewhouse (Heiner Brau). While I understand pairing light food with light beer, I think there could have been more to this. Still, for the second course out of five, I guess it did the trick... to a degree. The salad was alright and the pilsner was reasonably crisp and a tad refreshing. Course three gave us my favorite dish and pairing of the night. 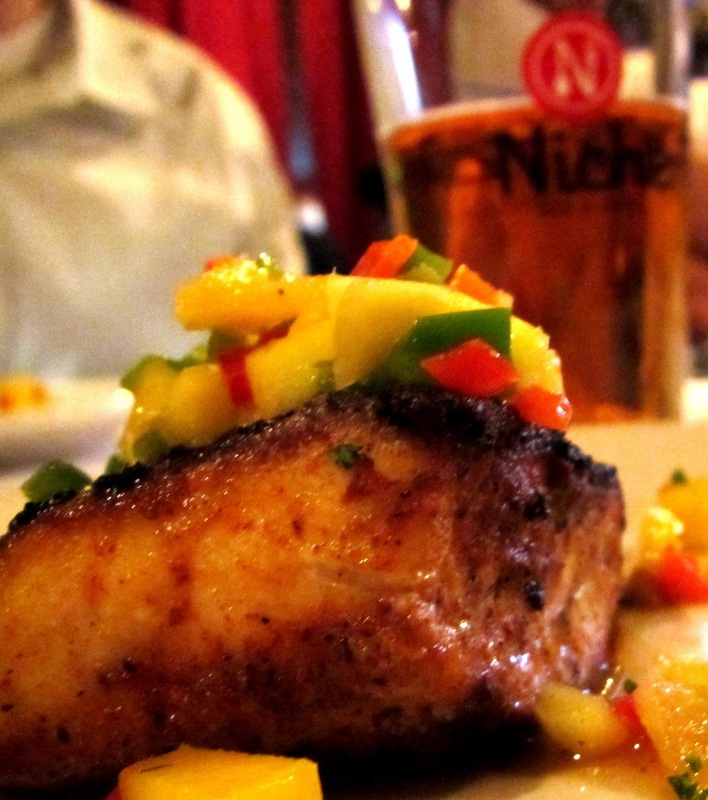 Chef cooked up a great blackened mahi with a spicy mango salsa, and paired it with the Bayou Teche LA 31 Biere Pale. The seasoning from the blackened fish beautifully complimented the pale ale flavors of the beer. The salsa also added some citrus flavors that matched the hops in the beer. All in all, this dish worked pretty well, and I ate every bit of it! Next up, Niche Bar and Grill decided to put a little meat in our diet. 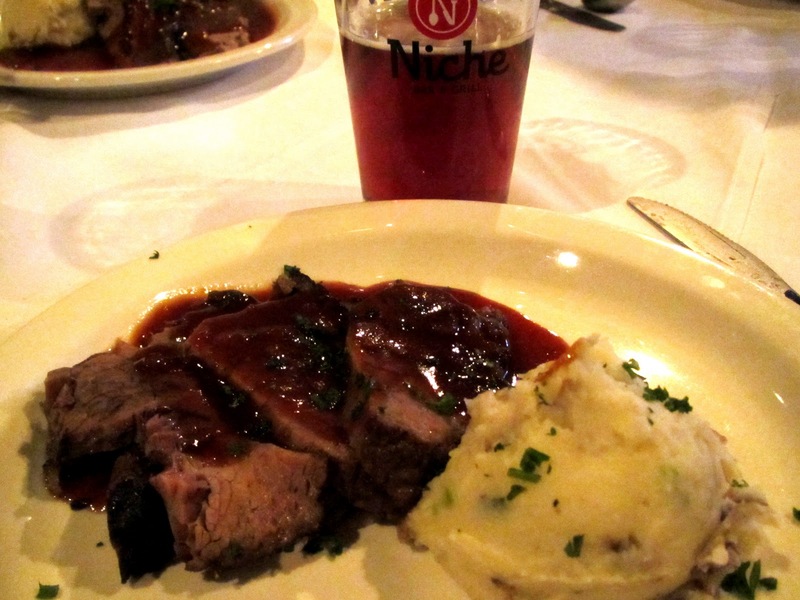 We had a beer braised beef brisket (I like the alliteration!) served along side the Tin Roof Voodoo Bengal Specialty Pale Ale. The brisket was actually slow braised in a Voodoo Bengal broth, which I think worked really well. The beef came out fork tender and covered in a pretty decent sauce. The dish also came with some fairly standard mashed potatoes. I think the brisket came in first place for many of the diners, but I still liked the fish better. But you know, to each their own, and the beef certainly tasted pretty darn good! Also, the beer hit home for me. The cane syrup used in the brewing process gave the beer just enough sweetness to counter the hops and pair nicely with the sugar in the barbeque sauce. 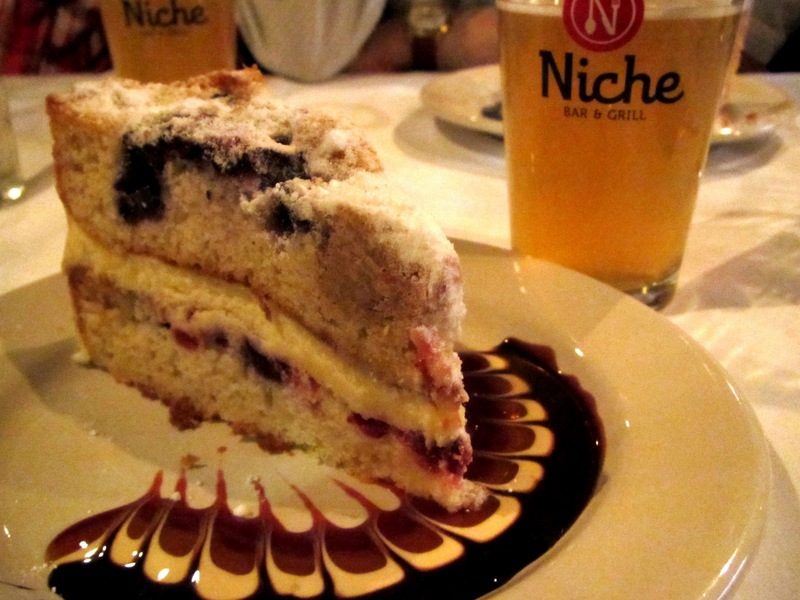 Finally, the dinner concluded with a lemon berry mascarpone cake and the Heiner Brau Strawberry brew. The cake actually turned out to be really well made. It was dense, fruity, and had a great layer of tasty cream that was not overly sweet. The Heiner Brau Strawberry worked with the sweetness to give a good flavor profile and accent the fruitiness of the cake. Again, complements to the chef. BONUS: As a little lagniappe, we all got a taste of another beer from Bayou Teche before the meal actually began. The Granade (the French settlers mistook Louisiana passion fruit for a type of pomegranate, so in parts of Cajun country they are still called granades (grruh-nod)) is a very lightly fruited wheat beer that was refreshing and unique. I actually think it may have been my favorite brew of the evening! The picture on the right is a Niche pint glass filled with the Granade. A huge thanks to Ause and Niche Bar and Grill for hosting this Louisiana Beer Dinner. Also thank you to the guys from Tin Roof, Bayou Teche, and Mockler for being there and sharing their passion and insights for the suds they create and market. If you missed the beer dinner, look for the fine Louisiana beers in your local watering holes, and keep an eye out for when Niche might do it again! Until then, drink ya later! Merry Christmas to all the beer fans out there. You can have a Christmas filled with beer if you get your wife to make the above dishes. I am sure going to enjoy.